The Lion Gallery01568 611898work Art GalleryThe Lion Gallery was opened in 2005 in Leominster to provide a showcase for the best in contemporary craftwork and fine art from the region. The Lion Gallery has since gone on to show nearly 500 makers. At The Lion Gallery you’ll find a changing stock of jewellery, ceramics, glass, textiles, wood and mixed media alongside original prints, photographs and some paintings. The Lion Gallery has a lively selection of greetings cards and wrapping papers as well. There is a programme of regular exhibitions as well as an ever changing range of stock from makers young and old – new and well established national names. A diverse range of high quality hand made craftwork from the best local and national makers will be on display. We are delighted to include a huge selection of jewellery, glass, wood and ceramics, together with original prints. Featured artist exhibitions change regularly. Visitors are welcome to browse in an informal atmosphere. Take a look at our website to see links to local artists and crafts people – Herefordshire has a wealth of talented artists and craftspeople throughout the county. The Lion Gallery was opened in 2005 in Leominster to provide a showcase for the best in contemporary craftwork and fine art from the region. 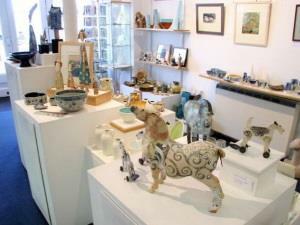 The Lion Gallery has since gone on to show nearly 500 makers.